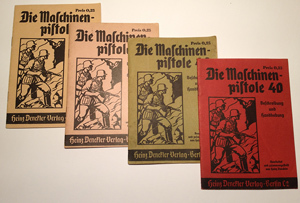 The MP38 and MP40 manuals. Studying contemporary manuals of historical firearms is a blessing for every arms-investigator, arms- collector or enthusiasts. Studying the differences between these manuals gives a good insight in the development of small arms. One of the big advantages of studying the original manuals directly is that one has the “pure” information first hand from the original source. Writers of small arms books always tend to make their own interpretations, which they should off course, but as time passes by other writers copy these interpretations as truth and in the long run misinterpretations get more or less accepted as the truth. A good example of a misinterpretation with regard to the story of the development of the MP38/40 is the false conclusion by many writers that Hugo Schmeisser did not have anything to do with the design of the MP40. One can read this in almost every description about the mp40 on the internet. Locating the original manuals to investigate is another story! Solid information about the MP38 and MP40 manuals is very scarce both in books and online. 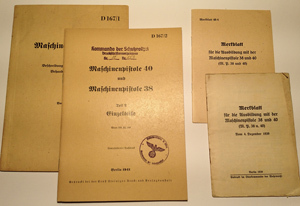 For the researcher, the original manuals like the “Algemeine Heeresmitteilungen” (General Army notifications), the “Heeresverordnugsblatt” (Army regulations) offer the most reliable information. To get hold of original manuals is very challenging. To say the least! If one is able to find an original manual, it is most likely the “Heinz Denckler Verlag” manual. Occasionally, one finds these for sale. However to find one of the original military manuals is simply finding a needle in a haystack. Fortunately good reproductions in both German and English are available. Since the original military manuals were the basic source of information for the succeeding civilian and post-war manuals this chapter is mainly centered around the original military manuals.